By Scott Gilfoid: Former IBF/WBA light welterweight champion Amir Khan (26-3, 18 KO’s) will be making an announcement about his trainer situation in the next few days. It’s highly possible that Khan will be giving his current trainer Freddie Roach the boot at that time and going with someone else to take over the training reigns. At this point I think it’s for the best that Khan dump Roach because his career has hit a tailspin with two consecutive losses. Whatever was working with them is no longer working and Khan can’t really afford to get sparked out again. He blasted out in his last fight in four rounds by WBC light welterweight champion Danny Garcia and in his fight before that Khan was beaten by Lamont Peterson. It’s unknown who will get the job to take over for Khan, if anyone, but whoever gets the job they’re going to have a lot of pressure on them to get the Khan train back on the tracks. I don’t think it’s possible to tell you the truth. Khan’s chin is going to remain a major weakness for him and he’s not going to be able to beat the best fighters at 140 or 147 lbs without getting tagged hard a lot. If he can’t handle taking a hard shot he’s going to keep getting knocked out far into the future. 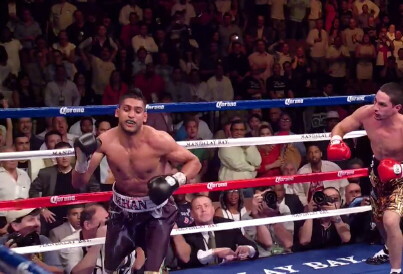 What Khan needs to do is take a bunch high hitters for the next year or so, and then look to have his promoters at Golden Boy Promotion to put him in a nice cash out fight with Floyd Mayweather Jr. Obviously, this is something that’s going to have to be done quickly because Mayweather is 35-years-old and he probably doesn’t have much time left in the sport before he starts taking losses.